Queen’s University Belfast researchers at the Centre for Cancer Research and Cell Biology (CCRCB), alongside local company Fusion Antibodies plc, have secured a prestigious Medical Research Council (MRC) award to develop a new antibody drug for the treatment of pancreatic cancer. The Queen’s researchers, who also receive support from Queen’s University Foundation, are addressing this gap by designing an antibody that specifically targets the surface of the cancer cells. To create these antibodies the Queen’s team will work with therapeutic antibody development specialists Fusion Antibodies plc to develop prototype molecules. Explaining the concept behind this new award, Professor Chris Scott (pictured above), Chair of Pharmaceutical Biosciences at CCRCB at Queen’s said: “Pancreatic cancer is the 6th most common cause of cancer death in the UK. “Our aim is to develop a new antibody drug that will re-arm and trigger the patients’ own immune systems to combat the disease. 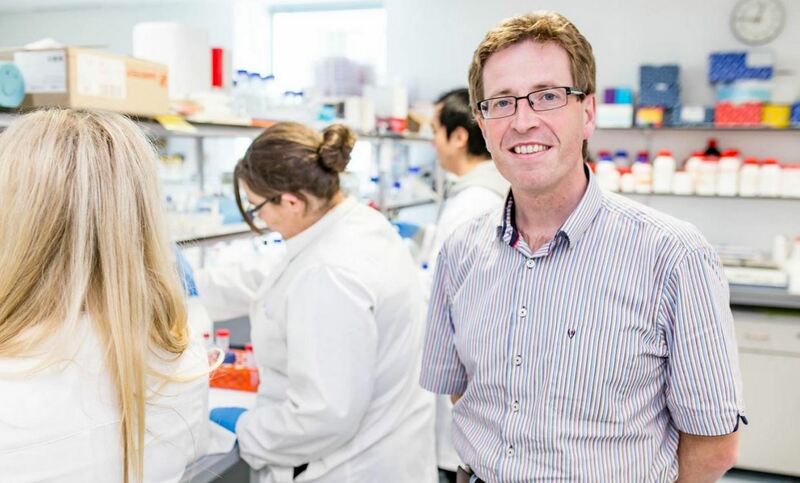 Dr Paul Kerr, Chief Executive at Fusion Antibodies remarked: “We are delighted to use our expertise in drug development and antibody engineering to collaborate with Queen’s University to generate new drug candidates for pancreatic cancer." To support pancreatic cancer research at Queen’s University Belfast, please contact Helen Surgenor, Head of Medical Fundraising on +44 (0)28 90971568. Media inquiries to Sian Devlin at Queen’s Communications Office on +44 (0)28 9097 5292.